If you are new to Singapore and seem to be in a pickle on where to take your juniors out for a fun-filled weekend, we got you covered! Water parks are almost mandatory in a weekend filled with joy and laughter, and luckily for you, there are more than a few kickass water parks in Singapore with different rides, unique structures and other watery amusement to keep you and your family in delirium for hours on end. To add on to what was previously covered in the first part of this series, here are a few more water parks to check out with your kids. Resorts World Sentosa presents you with more than just theatrics and casinos. If you are looking for fast slides and swashbuckling fun with your family, we are sure you won’t be disappointed with the thrills and spills that Adventure Cove Waterpark has got to offer. Resorts World Sentosa’s Adventure Cove Waterpark brings forth an entirely new dimension of exploration and stepping the game up with immersive water programmes. In between the swirling water slides and the beautifully exotic and colourful marine life at Adventure Cove Waterpark, we bet you and your juniors will be scooting around to have a go at everything! Begin your fun at the Adventure Cove by plunging yourself into a giant-sized tube and float merrily away along the Adventure River. All you have to do is lie back and enjoy the long and winding journey encircling the Adventure Cove Waterpark through its lazy river as it drifts you into the enigmatic Grotto, followed by the Aquarium Tunnel swarming with fishes before heading past the scenic Ray Bay. Feel your senses heighten along the lazy river with the reverberating sounds of the mysterious forest, veiled ruins and dazing waterfalls around the corners of this 620-metre long water passage. The entire Adventure River is approximately 0.9 metres deep. Visitors are allowed to leave their floats and swim along the river at any point if they wish to. However, weak swimmers and especially young children are advised to put on a brightly coloured life vest before diving into the river. At the heart of the waterpark is the Bluewater Bay, a pool that sends a surge of whopping waves at regular intervals. Prepare to squeal in delight when that happens as everyone would quickly dive, swim and waddle their way to the middle of the pool to catch the giant wave. Note that the wave can reach a height of two metres, and as such, children and weak swimmers should don life jackets provided by Adventure Cove. Lifeguards are also on hand to keep a watchful eye over at this section of the waterpark. Now comes the fun bit. 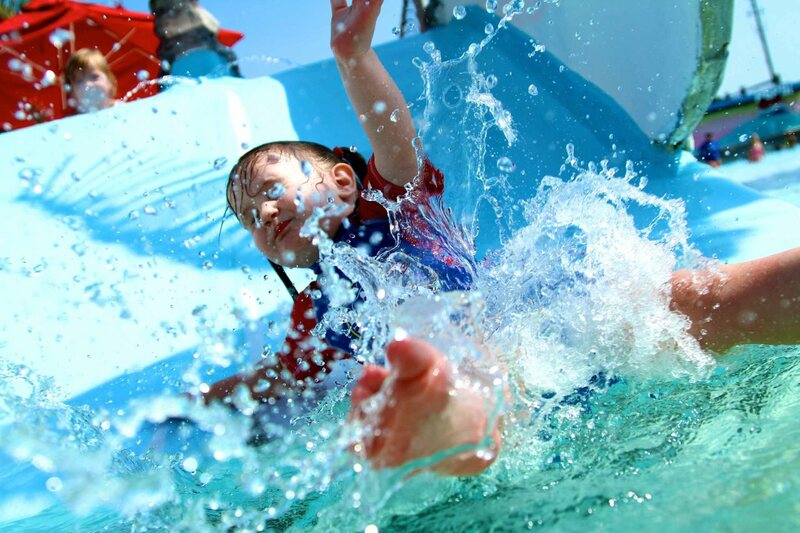 Flanking the Bluwater Bay wave pool are Adventures Cove Waterpark’s fast slides. There is a total of six slides for visitors to enjoy — the Whirlpool Washout and Spiral Washout are located on the left of Bluwater Bay, while the Dueling Racers, Pipeline Plunge, Tidal Twister and RipeTide Rocket are on the right. These slides are more or less laid in the order of thrill and excitement from left to right. Most of these rides, except for the Dueling Racers, have a two-person float option, which means that a parent can pair up with their junior and enjoy a whirling time down the slides together. For the bold and courageous, the RipTide Rocket will most likely be your favourite water slide. This hydromagnetic ride will have you sit on a boat before it accelerates in roller coaster style by a chain of magnets, releasing you into a gripping and exhilarating water ride. If your juniors are too young to these rides, fret not as the Big Bucket Treehouse offers an equally enjoyable hideout for the little ones. This section of the water park is only 0.3 metres in water depth, and it is equipped with water buckets and spray guns, as well as two low-ramp slides for your juniors to feel the invigorating rush of being flushed down by a water slide. Out with your little ones to visit the animals at the Singapore Zoo and appreciate the lush greenery as well as beautiful rain forest scenery abound that area? If you need a short, cooling break from the giraffes, monkeys, chimpanzees, tigers, elephants, zebras, seals, otters, rabbits, lemurs, cheetahs, crocodiles, geckos, flying fox, pygmy hippos and komodo dragons, among others, why not head over to the Rainforest Kidzworld play area for children within the zoo itself. Once you make your way inside, the first thing that will most likely catch your eye is the humongous water play area at the heart of Rainforest Kidzworld that offers splashing fun for kids of all ages. The Rainforest Kidzworld water area is designed with an animal theme and features water cannons and spray jets too. There are also water slides for your kids to enjoy along with a tipping oversized water bucket that sends a deluge of water gushing down at regular intervals.